As the anchor is the boat’s most important piece of safety equipment, it must be very rapidly available and, once deployed, it must set immediately. The SPADE anchor has only one tip, and it is very sharp. Nearly 50 % of the anchor’s total weight is applied onto this tip. This unique characteristic gives the SPADE anchor a superior ability to penetrate the sea floor, even into hard sand and through weed. The sharper the tip, and the greater the weight on it, the more rapidly and reliably will it penetrate the sea bottom. Many existing anchors have their preferred sea bottoms : they are not versatile devices ! Many sailors carry several types of anchor, imagining each will suit its particular type of sea bottom. This is, at best, an inconvenient solution for the problem of variable sea floors ; but at worst, in an emergency, it can be disastrous. You normally do not have the time, or the ability, to know what kind of bottom you will meet – especially in an emergency. The angle of attack at which an anchor meets the bottom dictates how well it will penetrate the bottom. The SPADE anchor has been designed to meet the bottom at an angle like that used with a chisel working wood : it has to penetrate. Many other anchors meet the bottom at an angle like that used on a spreader pushing filler : they can onl resist penetration. SPADE’s logically ideal angle of attac, together with its sharp edges and point, explains why the SPADE anchor has such superior penetration characteristics. The SPADE anchor meets the bottom like a chisel meeting wood, while some other anchors meet the bottom like a spreader pushing filler. This logically ideal angle of attack, together with the SPADE’s sharp edges and point, explains why the SPADE anchor has such superior penetration characteristics. In dense weed the SPADE’s unique design allows it to penetrate through the weed, before digging deeply into the seabed below. The shape of a “cutting tool” is the only one designed to penetrate. The SPADE anchor is the only one to have these design characteristics (patented). Typical behaviour of plough anchors, or of flat anchors without a stabilising strut. The anchor’s hold is cyclical : dig in, release, dig in, release …. In some cases the anchor will not be able to dig in again. An anchor that digs in but doesn’t hold is worse than useless : it is positively dangerous. On arrival you check your anchor’s set, and everything seems to be in order. But it’s a false sense of security : when the winds get up, such an anchor lets go, and the boat starts to drag. Over many years, aeronautical engineers have devised a system to measure the resistance of various profiles to movement through a fluid medium. This measure is called the coefficient of resistance of the profile. For an engineer, “fluid medium” includes all materials that can deform to allow an object to pass through : “fluid medium” includes all materials in the range from air, water and other liquids, to sand, soil, and sea floors. The SPADE anchor is designed around the concave profile, which ensures that, once buried, it will compact the sea floor material within its form, rather than sliding through it like a plow. It must offer much higher resistance to movement than anchors using other profiles. The SPADE anchor is the only one to use this profile (patented). – 4. If the traction force exceeds the bottom holding characteristics, the anchor must offer constant, and maximum, resistance to dragging. A basic requirement of an anchor is that it must not let go under strong load. If a strong wind causes the anchor to let go, the boat will turn side-on to the wind, and soon start moving with speed. As the boat gains momentum the anchor will never be able to hold again. The SPADE anchor, during the same type of tests, has shown an exceptionally high holding power. Equally importantly, when tested under loads so high that the anchor must begin to move through the bottom, SPADE anchors have consistently offered a very high and fairly constant resistance to movement. 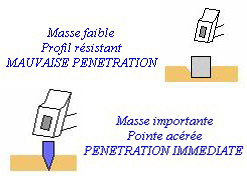 Typical behaviour of plow anchors, or of flat anchors without a stabilising strut. Typical behaviour of fluke anchors with a stabilising strut. The anchor drags, often at the worst moment, and will never dig in again : it skates across the bottom on its side. The SPADE anchor always remains deeply buried, without cyclic (or corkscrewing) behaviour, or releasing its hold : it continues to assure maximum holding power even under extreme load. With a major change in direction of wind (or current) most anchors will break free. The anchor then drags, hopefully for only a few metres, before setting again under the new load direction. Thanks to its concave profile, and to its high holding power, SPADE anchors pivot within the bottom, towards the new direction of load. As the new load comes on, the SPADE anchor just sets in a little deeper, and keeps on holding. When an anchor is first dropped, or during a change in direction of load, it may become entangled in its rode. When the load comes on, the anchor cannot then react as it was designed to, and can only drag along the surface of the bottom. Anchors that can allow this to happen are poorly designed, and dangerous. Thanks to its neat design, there is no part of the SPADE anchor that could entangle the rode. During independent tests, attempts have been made to tangle the anchor in its rode, but under load the SPADE always takes up its correct alignment. (If you have the chance, try this yourself !). Remember MURPHY’S LAW : if something can go wrong, it will do so at the worst possible moment. With SPADE anchors, it cannot go wrong : the rode cannot entangle in the anchor. An anchor that holds on so strongly to the bottom, no matter the load, must be physically very strong. It must not deform, or break, under extreme load. SPADE is designed for strength. The shank is designed to be strong yet light, with the classic trapezoidal profile (like a box girder) being used in our welded models. With the new, casting technique now used for most of our models, the shank has an “I” profile for the same reasons. The shank sockets into the body of the anchor, with a socket supported by double triangulation, giving a rigid and indestructible joint. All our anchors are made of high tensile steels, or high resistance aluminium alloys, and of scantlings designed by a mechanical engineer to be very strong. The shank profile and the coupling to the blade, together with the use of high resistance steel alloys give to the SPADE anchor a very high mechanical resistance.